There have been so many mixed reviews of this one, Keertana, that I'm so glad you managed to enjoy this one so thoroughly! Honestly, I love self-discovery books, and I think I will fall in love with this book. It's interesting that you didn't have as strong of an emotional connection with this one as you did with If I Stay or Where She Went- I was actually surprised by the lack of emotional connection that I didn't feel in If I Stay. I mean, of course, there was emotion, but not as much as what I think other readers felt. Nonetheless, this one sounds like such a realistic story about finding yourself- which is actually something that I struggle with myself. After a big move, I've been kind of struggling of showing off my real personality and figuring who I really am. Of course, I think every teenager goes through this, but I enjoy thinking that I'm kind of special. ;) However, I think I'd be able to relate to Allyson really well, not only because of the self-discovery, but because I've always been that good kid, who doesn't live as much as other teenagers (not that I'm not happy with that, I'd much rather read a good book than go out and get drunk, or something). Keertana, thanks for sharing what you've enjoyed from reading the book! I like stories that help us feel into the depth of enjoying what life is truly about and I think I can resonate with Allyson's journey. Brilliant review! I love Gayle Forman's writing! And it seems like Just One Day won't disappoint. Allyson seems like SUCH a real character that almost everyone can relate to in some way. I think that self-discovery stories bring out the most in someone, may it be because it's thought-provoking, or just simply relate-able. I'm glad to hear that you loved watching her find herself and watch her grow alongside other characters. I can't wait to pick this one up, because I think I'll love it! Thank you for the beautiful, breath-taking review, Keertana! Great review, Keertana! 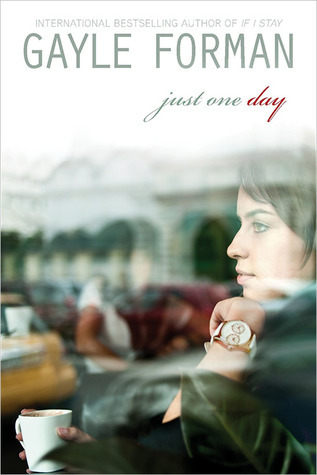 I'm looking forward to reading Just One Day. "I wasn’t sure if I was laughing or crying for I was so full of giddy happiness and bittersweet longing - those are the types of feelings a Gayle Forman novel inspires in you." Such a beautiful review, Keertana! I'm glad that even though this was a hit for you, you're able to pinpoint some of the reasons other readers have had disappointed reactions. I'll admit I'll probably wait for the excitement of this one to die down before I pick it up (heck, I still haven't worked up the nerve to read Where She Went after the emotional train wreck that If I Stay left me in). I LIKE the idea that someone you spend just one day with can completely change your life and help you define who you are. I truly think there are little moments in our lives like that which can influence the rest of our lives, so hopefully I'll end up loving this one. We shall see! I really loved this book! I pointed out that I loved that the side characters were well fleshed out but you're right, her father wasn't for some reason. I loved her journey as well. This is one I know I will reread and I rarely reread! My emotions were also all over the place while reading! I felt very protective of Allyson, and I was SO proud of how much she had grown by the end of the novel. She summoned such bravery and backbone to travel alone and face Willem. I just hope he proves he's still worthy of her in Just One Year! "I am still convinced that I have not extracted the full depth and meaning that this story has to offer." I've heard so much about Gayle Forman and I feel guilty for not yet having read one of her books. So I know I need to do this shortly. I'm glad to hear you enjoyed this because despite hit and miss reviews I knew you were looking forward to it and it's made me want to try Forman even more. It sounds like a really good novel and I don't think anything is perfect. What a perfect review, Keertana! I understand exactly how hard it is to explain when something's missing, and it always happen with an author you know and love. Just think of The Raven Boys, that was how it was for me. I doubt I'll read this until the next one comes out, but I'm definitely looking forward to it. As I said, absolutely flawless review. I am so happy that you enjoyed Just One Day so much, Keertana! Despite not being a fan of If I Stay (I know! What's wrong with me! ;)), I do want to give Just One Day a try. I really like the fact that it's so focused on Allyson's self-discovery and figuring out what she wants out of life. I do want to read a book where I really can appreciate Forman's writing, and this sounds like much more my style. A lovely review Keertana! I really enjoy books about self-discovery & despite being one of the very few people who didn't enjoy If I Stay & Where she Went, I am still quite eager to read this book, especially after reading your praise.